According to Hopi mythology, a race called the “Ant People” saved the Hopi to protect them during an ancient global cataclysm. Below are some Hopi rock carvings from northern Arizona. This modern Australian aboriginal piece, “Going for Honey Ants”, is done in a style that has likely been passed down for generations. Insects such as honeypots ants have been a feature of aboriginal culture for thousands of years. An inspired 19th-century piece by artist Shibata Zeshin (1807-1891). This work, “Kaki to ari” (“Persimmon and Ants”), is held by the Museum of Fine Arts in Boston. 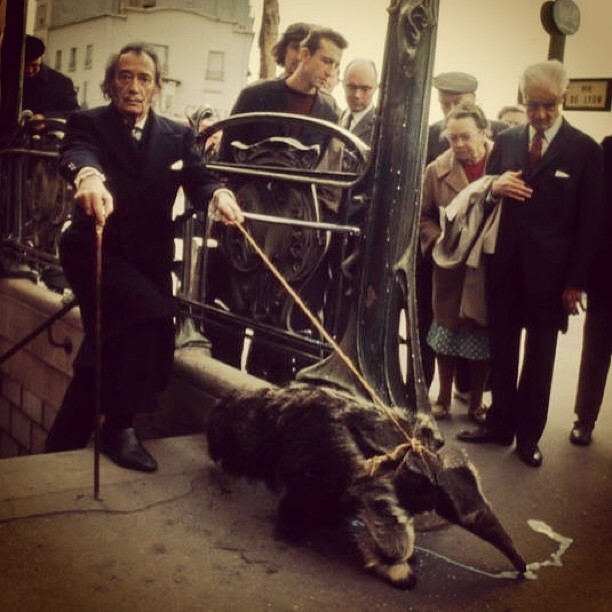 While artist Salvador Dalí is known for his hideous, immoral behavior of keeping an anteater as a pet, he also included ants in some of his most famous pieces. Can you find the ants in The Persistence of Memory (1931)? This famous artwork by M.C. Escher, Möbius Strip II (Red Ants) was completed in 1963. While the morphology of the ants leaves something to be desired, it is hard to argue with the immortalization of ants in art. In 1989, Japanese artist Yanagi Yukinori unveiled a true beauty, The World Flag Ant Farm. What appears at first to be simply a bunch of divided world maps is actually a piece of art that represents the world as one interconnected ant colony. This work, which sold for $35,000 as reported in The Telegraph in 2010, was completed using the bodies of 200,000 ants. It is called “Self Portrait With a Gun”, by Californian Chris Trueman. Editor’s Note: The art presented above is merely a sample of the ant-inspired art produced by enlightened humans over the course of thousands of years. Posted in Art & Media, Culture. Bookmark the permalink.